I was out and about for 4 hours this afternoon attending that groundbreaking and then doing errands. The wind was a little…well…underwhelming. Gusty wind at times, calm other times…seemed just a little winder than an average blustery April day. I just saw a Twitter post from another media outlet saying a “strong wind storm” is on tap for tonight…but that’s definitely not the case. The 35-50 mph gusts we forecast DID end up materializing, but it was another relatively weak wind event in our area and nothing like last year’s April storm. Portland barely hit 40, and only a few thousand PGE customers lost power at one time from tree limbs or trees that fell here and there. Not a “non-event”, but not a windstorm in the valleys either. Models show wind gradually decreasing this evening/overnight. We’ll lose the warm daytime mixing too which means we just have a breezy night ahead. Gusts will be mainly in the 25-35 mph range through the night, more like 20-35 mph by sunrise Sunday. Expect lots more rain tonight…it’ll be a soaker! 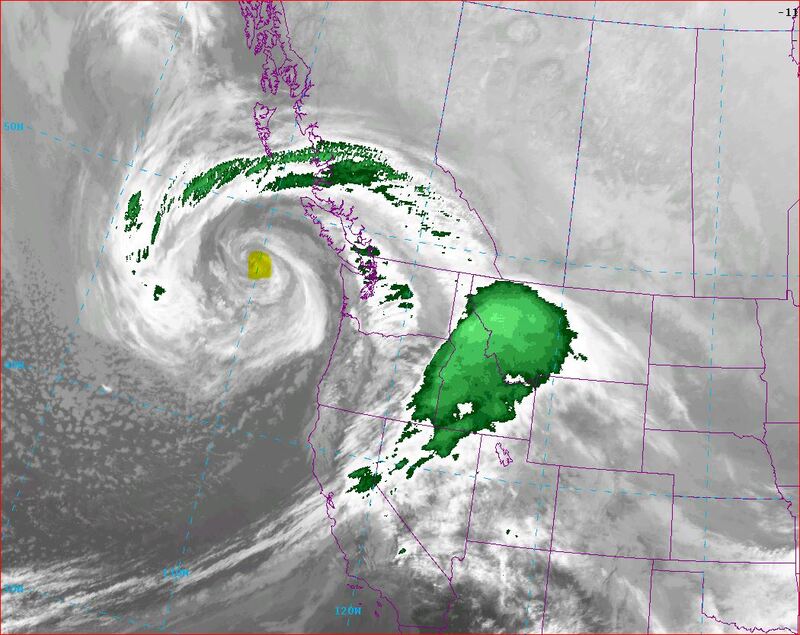 The yellow spot is the location of the low pressure center. Notice it’s just now making it across the important 130West longitude? Unless the low is far deeper, here in the interior valleys we generally don’t get big windstorms with storms this far offshore. With this image I’ve added the expected movement of the low (in blue) and then a more typical windstorm track for the inland valleys. Coastal wind (so far) appears to be significantly weaker than expected once again (it happened with last April’s storm). I see a 72 at Cape Foulweather, but lots of 45-60 mph gusts otherwise. Windy, but nothing too crazy out there. Inland wind gusts will ramp up with daytime mixing. Pressure gradient will line up better with the north/south valleys the next 12 hours. Peak gusts still likely in the 35-50 mph for most of us in the valleys. That could happen anytime between now and early Sunday morning. Not a big windstorm by any means, but plenty of power outages and a few trees down. If you have any outdoor activities, they can still go on since showers will come and go, but expect a blustery & wet spring day. If you are an organizer of an outdoor event I sure wouldn’t cancel it. I’ll be at the Crown Point Country Historical Society groundbreaking event in Corbett at 11am…looks windy. At least the ground will be soft for plunging those shovels into the ground! You are currently browsing the FOX 12 Weather Blog blog archives for the day Saturday, April 7th, 2018.